I’ve been using Cool Edit to work with audio for more than 5 years now, and while there’s a few things about it that bug me, I haven’t found a cheap and reliable replacement. I tried Adobe Audition, which is essentially the upgraded version of Cool Edit, but didn’t find enough features that suited my needs to justify the $350 price tag. A year or two ago I had taken a look at a beta version of Reaper. But it crashed my computer. Repeatedly. So I moved in. A few months ago I took Reaper for another spin for an article I was writing at Download Squad. I have to say I was pleasantly surprised. Probably my favorite feature was “ripple editing.” Most good audio editors have a feature that lets you make remove a section from early on in the audio while automatically sliding the rest of the audio over to the left. If you’re planning on cutting a few seconds from a 4 minute song, this might not seem like a big deal. But if you’re trying to whittle a 45 minute interview down to 3 minutes, this feature can be a life saver. And it’s something that’s missing from Cool Edit. I’ve found a few workarounds over the years, but nothing that works as well as ripple editing in Reaper. So when I had an hour’s worth of sound yesterday that I needed to edit down to 12 minutes, I pulled out Reaper and snipped away. A project that could have taken all day in Cool Edit took just an hour or two. If anything, there are a few too many options in Reaper, since it’s built for musicians and other audio producers who need more than voice and ambience editing. For example, calculating the best amplification settings in Cool Edit is a breeze. In Reaper it’s a bit more complicated, and unless I’m missing something, requires effects plugins. But the result is much more control over the output. I’ll probably continue using Cool Edit as my primary audio workstation for a while, because it’s what I’m used to and I just don’t have time to learn all the ins and outs of another program right now. But I’ll be keeping Reaper around and pulling it up when I have tasks to work on that are a bit much for Cool Edit. 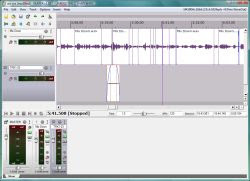 Reaper is far more powerful than Audacity. But at its most basic level it’s pretty easy to use. And I figure the more I use it, the more familiar it will become until maybe one day I can make the switch. Oh yeah, and best of all, there’s a 30 day free trial. The license is $40 for non-commercial use, and $200 for commercial use. But if you don’t register all you get is a note reminding you that you should probably pay up if you find the software useful. Right now my only two complaints with Reaper are that updates are issued too often. Every time I open the application I get a note alerting me that a new version is available for download. And the second problem isn’t their fault. But since an upcoming TV show also happens to be named Reaper, and since Reaper doesn’t have an obvious domain name, it takes a bit of extra Googling to find the product’s web site if you haven’t bookmarked it.